Manchester City are on the brink of a third Premier League titleManchester City boss Pep Guardiola will play golf rather than watch Manchester United's game against West Brom on Sunday - despite knowing his side could win the Premier League title.City, who beat Tottenham 3-1 on Saturday, will be crowned champions if United lose at Old Trafford. "The only score I want to know is bogey or birdie," said Guardiola, who will play with his son. "The important thing is to have the chance to win at home. I am delighted to have the chance to win in front of our people. "City let slip a 2-0 lead to lose 3-2 in the Manchester derby on 7 April, when victory would have clinched the title.Former United manager Sir Alex Ferguson was playing golf when the Red Devils' first Premier League title was confirmed by Oldham's victory at Aston Villa in May 1993. 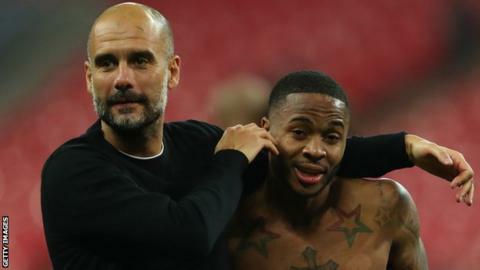 Gabriel Jesus and an Ilkay Gundogan penalty put City 2-0 up against Spurs at Wembley, and Raheem Sterling sealed victory after Christian Eriksen scored against the run of play.England forward Sterling has scored 17 league goals this season - and 22 in all competitions, at least twice as many as he has previously managed in a season.The 23-year-old, who has been nominated for the PFA Young Player of the Year, was criticised for missing chances in the defeat by United and also wasted opportunities against Spurs before smashing home from close range in the 72nd minute. "The moment Sterling increases his goals, he will be one of the best players in the world because he has everything," said Guardiola. "He is young and he is able to do it. "Former Arsenal striker Ian Wright said on Match of the Day: "People talk about the misses but he has to carry on. "The way he got in positions... he's been doing it all season and he's not afraid to get in there and miss chances. That's what will make him carry on scoring." City had endured a torrid 10 days, losing twice to Liverpool as they were knocked out of the Champions League quarter-finals, with the derby defeat sandwiched in between.But Guardiola said: "I said to my staff after 10-15 minutes, 'after today we will be champions'. "After the last week to come here and play like we did, we will be champions. "People say it was a big failure, what happened last week, but they don't understand the reality of football. "You can win the Champions League in seven games; the league is 10 months. "I'm sorry, it's much more important what these guys have done this season."